My edition: Paperback, published on 30 July 2015 by Harper, 396 pages. Description: They had found paradise. What would they do to keep it? With a quick spin of the globe, Kitty and Lana escape their grey reality and journey to the Philippines. There they discover The Blue – a beautiful yacht, with a wandering crew. They spend day after languorous day exploring the pristine white beaches and swimming beneath the stars, and Lana drifts further away from the long-buried secrets of home. But the tide turns when death creeps quietly on deck. A dangerous swell of mistrust and lies threatens to bring the crew’s adventures to an end – but some won’t let paradise go…whatever the price. I vividly remember getting my hands on the much-talked about summer book of 2013, The Sea Sisters, which introduced me to the amazingly atmospheric writing of Lucy Clarke. Highly engrossing and filled with complicated family dynamics, exotic locations and a good dose of intrigue, I was instantly hooked and knew I'd discovered a new favourite author. This feeling was reaffirmed when I read her second novel the following year, A Single Breath, which was an incredibly layered book that remained unpredictable until the final page. Not to mention that it was set in Tasmania and the rich descriptions of the island had me yearn to return to this beautiful place. And for the third year in a row, Lucy has written the summer novel of the year. The Blue feels familiar yet also completely fresh, as it is much more haunting and disturbing than either of her previous books. We meet protagonist Lana in New Zealand, where she hears on the radio that a yacht by the name of The Blue has sunk off the coast of the island, and from that moment on we flick back and forth between the present time and some months earlier, when Lana and her best friend from back home in England, Kitty, first step aboard of the yacht and their incredible journey begins. At first their adventure with the other members of the crew seems like the perfect escape from reality; they fish for their own food, drink a lot of rum and enjoy their stunning surroundings and the gorgeous sunny weather. But as tension mounts aboard The Blue and loyalties shift, Lana realises it might not be the safe haven that she and Kitty believed it to be. Behind the beautiful facade of the yacht dark secrets brew and it's only a matter of time before someone has to pay a terrible price. There are very few people who manage to completely transport me to far and exotic places with their atmospheric writing, but Lucy Clarke is one of them. As soon as I dived into the pages of her new novel I felt the heat and humidity of the Philippines and was hit by the spicy fragrance that scented the air during Lana and Kitty's visit to the country. Despite having never been there myself, the place came alive in front of my eyes thanks to Lucy's incredibly descriptive writing. And when Lana and Kitty first joined The Blue, their exhilaration at having found the key to freedom was an equally vivid moment for me, which continued for the duration of their journey even though with each turning page the story became darker and more unpredictable. It was a completely engrossing and electrifying trip not only for the characters, but for the reader too. When the initial thrill of having joined the Blue wore off and the underlying suspense slowly surfaced, I was quite literally sitting on the edge of my seat, barely able to read quick enough to satisfy my craving for wanting to find out what would happen next. 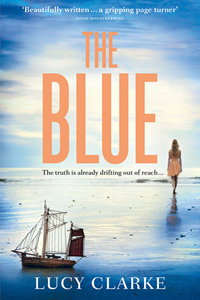 The Blue is a beautifully atmospheric novel, which transports characters and readers alike to faraway locations so stunning that they almost don't seem real. Yet at the same time there is something sinister rippling along the edges of the story, always there but just out of reach. It creates an electrifying experience and one that will haunt readers long after they have turned the final page.